I just want to say a huge thankyou to my new & regular followers. It means so much that you read what I have to say. 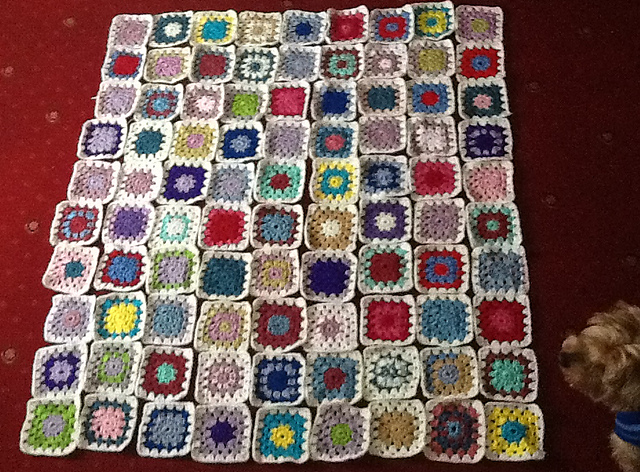 Well I got to 117 squares and decided that would be enough for a nice little lapghan for myself. 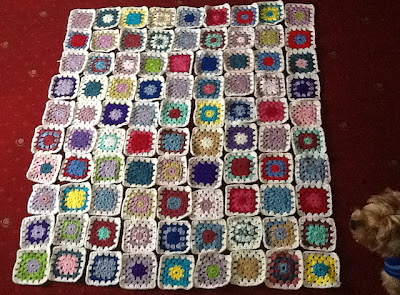 Originally I laid them all out on the lounge floor to sort out which square I wanted & where. After trying it out for size, I decided to do a few more to make sure my feet were covered whether I was sat on the bed or in the chair. I also added a cream & lilac edge just to finish it off. Here it is hanging on my washing line on one of the many sunny days we've had here lately. Isn't it just so bright & cheerful!! And its soft and cosy to have over my legs. 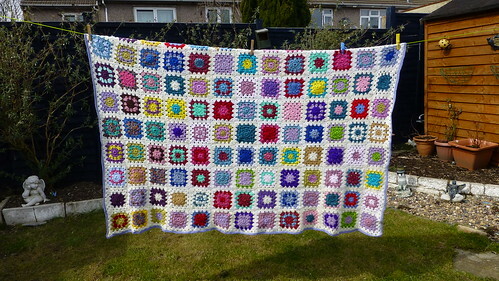 I'm still doing the GrannyADay project, but I also want to try out other crochet stitches. So I'm following this tutorial by The Crochet Crowd on how to do a ripple stitch. 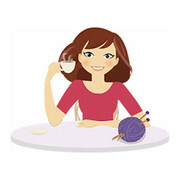 Mikey makes it so easy to follow & also gives tips on how to read a crochet chart. The weather has been amazing these past few days. Last Sunday we had the warmest day of the year, which had the most warming breeze. It's nice to be able to get outside for a while, listen to the birds sing and get some fresh air without a multitude of clothes to keep the chills out. Another project I'm working on is an Aran cardigan for my other half. He's always wanted one, and I've always wanted to do a cable pattern. I've done the ribbing and one block of the cable pattern. It's took several attempts to get the pattern to look right & at first I thought the designer had made a mistake. But I hid myself away and concentrated on each stitch and wham! I got it right. I've made a swatch of just the stitch pattern, so if I'm not sure it's right i can refer back to that and give a cheer if it's right lol! As my youngest has taken my batteries (College course took precedent) I can't take any pictures, but I promise on my next post I'll make sure I take some. Well it's time I went & got on with the cardigan.